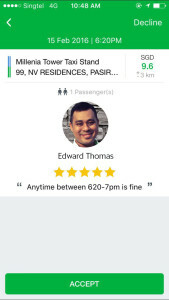 We’re delighted that you’re joining our community of GrabHitch drivers. 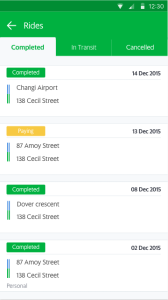 When you create your route, you can schedule it to repeat on multiple days. For example, you can select your daily drive to work to repeat every Monday to Friday. We will search for a passenger for you every morning as long as the route is valid. You can use this to create one-off routes too – just set the time and day of week and delete the route after your trip is done. After you click on the driver tab, you will reach the Driver Main Page. Click “Create Route” to begin. 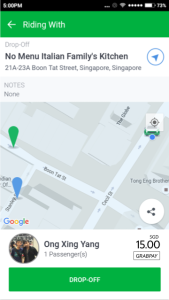 To review and accept the request, go back to the GrabHitch driver main screen by clicking on the “GrabHitch” tab followed by “Driver.”Click on the routes you previously created to see the passenger who you’ve been matched to. 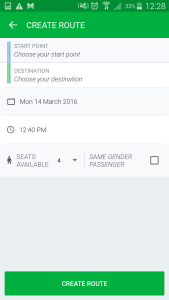 On this screen, You will be able to see details of the passenger and his/ her trips. 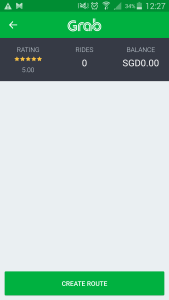 Click “ACCEPT” at the bottom of the screen if you are able to offer a ride. Once you click “ACCEPT”, the passenger will receive a notification. You will come to a screen with a list of your accepted rides. A green completed label means the ride is completed and payment has been made.The yellow paying label means that payment is still being processed. The blue confirmed label means the ride is upcoming. Click on the ride to see your passenger details and directions. The grey label means the trip was cancelled. Click on the Navigation Arrow on the top right to start navigation to your passenger. This will direct you to your passenger’s destination as well. Once you are at the pick up point, click on “I’M HERE”. This notifies the passenger that you have arrived. Once the passenger gets into the car, click on “PICK UP” and you’re on your way! Ensure the passengers get off safely and then click on the “DROP OFF” button. 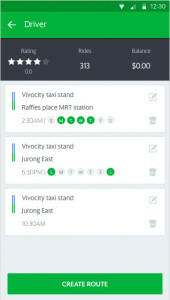 Preferred payment method should be reflected with either GrabPay or Cash before you pick the passenger. 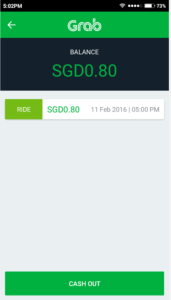 For payment options by GrabPay, you will see your fare reflected in the e-wallet, on the main driver page under “BALANCE”. As GrabHitch is a social platform, do call or message your passenger to let them know that you are unable to give them a hitch. Do the same as you would do for a friend. Who knows, you might hitch the same person again in the coming weeks. 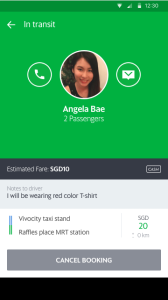 For payment options by GrabPay, every ride you do will be credited into your driver e-wallet. You can see your balance directly on the driver screen. To access the details, you can click on the “BALANCE” section on the top row of your driver screen. You will see your earnings from each trip.